In-app design review tool to inspect measurements, attributes, and animations. Want to be notified of new releases in willowtreeapps/Hyperion-iOS? If you like what you see, there's more where that came from. The View Inspector plugin allows you to inspect the properties of any view live within the app. Have a tiny view you want to inspect? No problem, you can zoom in on any portion of the app while the plugin is active. The Measurements plugin allows you to measure the distance between any two views on the screen. No more guessing whether padding is correct-this plugin has you covered. Having trouble verifying an animation matches design? The Slow Animations plugin allows you to slow down all animations within the app to 75%, 50% or 25% the normal speed. Calling all developers!!! Be one of the first to create a third-party plugin. The plugin creation guide is a work in progress, but if you are feeling ambitious you can reference the plugins we have already created along with our documentation. Once Hyperion is integrated into your app, simply shake your phone. 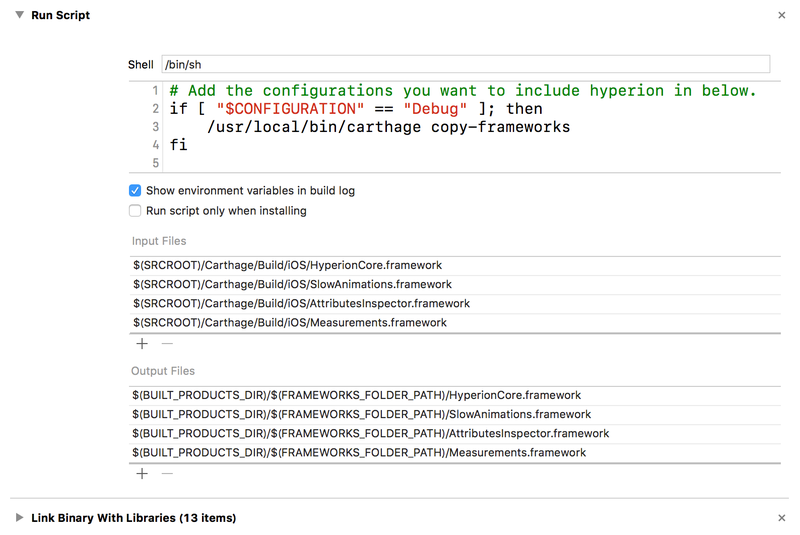 Hyperion was designed as a drag and drop framework that requires 0 code to integrate. If you want to customize Hyperion you can create a configuration file (called HyperionConfiguration.plist). Use this file as an example. For now you can only configure what gestures trigger the Hyperion drawer, but there are plans to add theming and plugin ordering. Want to learn how to use Hyperion? The example app will teach you! Build the example project by cloning the repo, run pod install from the Example directory, then open in Xcode and run. Since Hyperion is primarily a debugging library and should never be included in production, the steps below will outline how to install Hyperion in a way that keeps it out of production builds. There is also a guide below explaining how to verify which builds have Hyperion and which ones do not. Note: Hyperion doesn't require any code to integrate, so it should just work once added. Important you must specify use_frameworks! if this does not work for your project, then refer to the Carthage or manual guide. #"Configurations => Debug" ensures it is only included in debug builds. Add any configurations you would like Hyperion to be included in. CocoaPods automatically handles ensuring that Hyperion will only be included in the configurations you have specified for the pods. For more information please reference CooaPods Documentation. To install through Carthage add github "willowtreeapps/Hyperion-iOS" to your cartfile. Then run carthage update. Drag and drop the created frameworks into your Xcode project. Important Make sure that Hyperion and any of it's frameworks are not included as embedded frameworks (Settings should be available in General project settings). Once you ensure that Hyperion is not included in the embedded frameworks change the status of the Hyperion frameworks under "Linked Frameworks and Libraries" section to optional. At this point your project settings should look something like this. #Add the configurations you want to include Hyperion in below. For more information on this custom build script please refer to the Carthage Documentation. You can download the latest frameworks here. There will be a zip file under the latest release called HyperionCore.framework.Plugins.zip. If you want to learn how to integrate into specific build configurations; follow the Carthage guide above. Clone the git repo. In the root directory run sh build.sh. Once complete, the script will have generated the HyperionCore framework along with all of the first-party plugins. The only required framework is HyperionCore, but you should add at least one of the plugins that was generated. Follow the Carthage installation guide above to ensure that Hyperion does not get included in production. Note: This only works if you are using Hyperion Frameworks. If you are using Cocoapods ensure that you have specified "use_frameworks!". Right click your IPA file and open it with Archive Utility. This should unzip your IPA. Inside the unzipped IPA there should be an Application file. Depending on how the IPA was built it might be in a Payload folder. Once found, right click the Application file and select "Show Package Contents". Inside the package there should be a folder called "Frameworks". Ensure that Hyperion and it's plugins are not included in that folder. If Hyperion is in that folder then that means Hyperion is included in that build. Ensure that none of the Hyperion triggers (shake, etc.) you have set activate Hyperion. This will show all of the shared libraries that are currently loaded in the app. Make sure that Hyperion and it's frameworks are not listed. Hyperion plugins need to be added into the app at build time. By default, Hyperion automatically finds every plugin that is available in the project. A feature is currently in progress that allows for specifying plugins in a plist for further customization. Contributions are welcome. Please see the Contributing guidelines. Hyperion has adopted a code of conduct defined by the Contributor Covenant, the same used by the Swift language and countless other open source software teams. Unable to run command 'StripNIB HYPKeyValueTableViewCell.nib' - this target might include its own product. This likely means you have not specified use_frameworks! in your podfile. If turning your pods into frameworks does not work for your project configuration, then please reference the Carthage or manual installation guide. Hyperion is available under the MIT license. See the LICENSE file for more info. Interested in working on more unique projects like Hyperion? Check out our careers page.